With heavy hearts the family of Linda Alice Blair, loving wife of Winston Blair, announces her passing that occurred on Thursday February 7, 2019 at the Saint John Regional Hospital. Born 1944 in Saint John, she was the daughter of the late Thomas and Doris (Foster) Corbett. 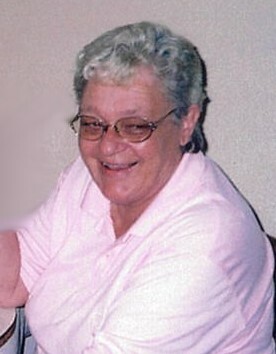 Linda was a long-time member of the RCL Branch #58, the Fairvale Outing Association and Peace Keepers. She was a talented artist who enjoyed travelling, knitting and playing cards. In addition to her husband of 54 years, Winston, she is survived by her son Thomas (Shelly) of Tracey, NB; daughters Lois (Leslie) Brookins of Musquash and Deborah (Glen) Blair of Bloomfield; grandchildren Chris, Curtis, Rachael, Laura, Robert, Sarah, Kaitlyn and Josh; 9 great-grandchildren; brother-in-law Bill (Glenna) Blair and sister-in-law Lois Graham both of Ontario as well as several nieces and nephews. Besides her parents, she was predeceased by her son Billy Blair and sisters-in-law Jean Fairweather and Betty Blair. Arrangements are under the direction of Fundy Funeral Home, 230 Westmorland Rd. By her request there will be no visitation of funeral service. A private family graveside will be held at a later date. The family would appreciate donations to the IWK or the SJRH Palliative Care Unit.